Quarterly Highlights - Arlington Works! Arlington Works! AmeriCorps members from REEP and Edu-Futuro helped host a regional launch for Northern Virginia AmeriCorps members during the 2nd Quarter. The event, which kicked off the service year for volunteers to the national program, was held on Oct. 7 at Arlington County’s Department of Human Services offices. Members from a variety of local AmeriCorps programs including REEP, Edu-Futuro, Aspire, CASA and the Virginia Reading Corps introduced themselves through several ice-breakers, such as giving a 30-second “elevator speech.” They also heard remarks by Jay Fisette, Arlington County Board vice-chair, and Virginia House Delegate Alfonso Lopez, who spoke about his family’s experience immigrating from South America to the U.S.
During the event, participants received results from a workforce personality assessment they did on-line and discussed productive ways to work with each other. Toward the end of the day, Kimberly Brown, a program officer with Virginia’s AmeriCorps office, administered the AmeriCorps pledge with the new members. Seven new Arlington Works! AmeriCorps members participated in a National Day of Service event in remembrance of September 11. Members solicited food donations from customers entering BJ’s Wholesale Club in Falls Church. All donated food items went to the Arlington Food Assistance Center (AFAC), Arlington’s local food bank. The Arlington Works! team participated on the afternoon of September 10. AmeriCorps members from Aspire (formerly Greenbrier Learning Center) AmeriCorps group also participated in this same event earlier in the day. Once they had a full cart of food, they moved the items into an AFAC van. Over the full weekend, members and other food drive participants raised a total of 3,723 pounds of food. Liz Lang, an Arlington Works! ESOL instructor, said, “It feels good that I am helping families get food for the week.” She regularly participates in AFAC food distributions at a local affordable housing property, as well. During the 1st Quarter, the Arlington Works! members also helped staff an information table at the We Are All Arlington! Event, held Sept. 23, as part of National Welcoming Week. The team members handed out information about REEP classes and Edu-Futuro mentoring programs to people attending the event at Wakefield High School. ArlingtonWorks! AmeriCorps members participated in three community service events during the 3rd Quarter of 2015-2016. On Jan. 18, the day of service to honor Martin Luther King Jr., ArlingtonWorks! members combined efforts with Aspire, another AmeriCorps organization, to help elementary school students at an international fair. The event, at Arlington Presbyterian Church, featured 20 booths with information from countries around the world. The seven ArlingtonWorks! members helped children learn a phrase or understand the cuisine from different nations. On March 8, the members helped clean South Second Street near Syphax Education Center. The litter pick-up was part of an on-going Adopt-a-Street effort coordinated with Arlington County. In the afternoon of that day, the ArlingtonWorks! team worked at Arlington Food Assistance Center, restocking and organizing donated food items. These two events were in celebration of National AmeriCorps week, which took place from March 7-13.
litter during National AmeriCorps week. In August, we bid farewell to the 2014-2015 Arlington Works! AmeriCorps team. In September, we welcomed the 2015-2016 AmeriCorps team. Members of 2014-2015 Arlington Works! AmeriCorps spent July helping run literacy pullout groups for morning Outreach students at Arlington Mill Community Center. The members, whose last day of service was August 14, also helped staff the APS Travelling Trolley, a reading initiative aimed at elementary school pupils in south Arlington. The new 2015-2016 Arlington Works! AmeriCorps members started on September 8 and spent time during the first three weeks doing intensive training. They also participated in two service activities with the Arlington Food Assistance Center (AFAC). For the September 11 Day of Remembrance, team members collected food donations outside two local Giants – the Virginia Square Giant on Washington Boulevard and Shirley Park Giant on South Glebe Road. This was part of a larger AFAC effort that went over the weekend. In total, 8,000 pounds of food were collected during those three days. Members also went to AFAC on September 16 and bagged chicken. Both activities helped with team building and allowed members to get to know each other more. Arlington Works! AmeriCorps members celebrated AmeriCorps Week in March by running a food drive, taking part in team building activities and participating in a panel discussion about next steps when their service ends. The eight members organized a two-week food drive for the Arlington Food Assistance Center at Syphax Education Center, Arlington County’s Department of Human Services office, and Arlington Mill Community Center. REEP students, as well as office workers or other staff, were asked to donate items such as canned soup, dry beans, cereal, rice, oatmeal, and canned fruit. In total, 208 pounds of food were collected. During the AmeriCorps Week celebration, Arlington Works! members participated in several team building activities, including doing a building scavenger hunt at Syphax. Members were given clues that led to Arlington Public Schools staff, or to an office in Syphax, where they practiced their “elevator speech” explaining what the program is. The week concluded with the annual “Life After AmeriCorps” event. Eight panelists shared how their past AmeriCorps experiences shaped the career they have today. Fourteen current members from Arlington Works, Literacy Council of Northern Virginia and Greenbrier Learning Center attended. building activities during the AmeriCorps Week celebration. Arlington Works! AmeriCorps members participated in two service projects during the 2ndQuarter, both aimed at cleaning up public spaces. On December 18, seven members of the Arlington Works! team, along with other REEP and Edu-Futuro staff, picked up litter along a 1-mile stretch of South 2nd Street close to Syphax Education Center. The effort was the initial step in a year-long Adopt-A-Street project through Arlington County’s Environmental Services department. The group worked on South 2nd Street from S. Uhle St. to S. Oakland St. and collected trash and recyclable materials. Team members said it felt good to be able to brush up the neighborhood street and to keep litter from contaminating local waterways and potentially harming wildlife. In a separate project on November 11, Veterans’ Day, Arlington Works! members Amy Gale and Rachel LaCroix joined a volunteer service event at Fort Mahan Park in Washington, D.C. The project aimed to improve the public park by building playground structures, clearing invasive species and picking up litter. 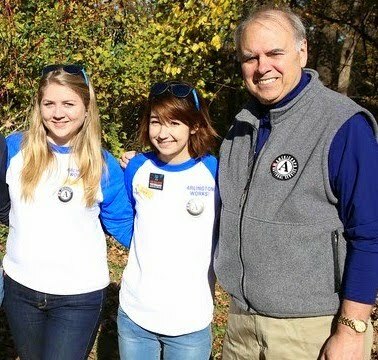 AmeriCorps’ national director, Bill Basl, attended the event alongside the volunteers. In August, we bid farewell to the 2013-2014 Arlington Works! AmeriCorps team. In September, we welcomed the 2014-2015 AmeriCorps team. Front row: Flor Cabrera, Amy Gale, and Catherine Heisey. The 13-14 team hosted its second Red Cross blood drive on July 23. Members recruited 17 donors, staffed the check-in table, and assisted volunteer donors with blood donations. Also in July on four Wednesday evenings, the 13-14 AmeriCorps team assisted with Arlington Public Schools’ Traveling Trolley, a summer reading program. A trolley (see photo) picked up children and their parents at the child’s regular bus stop and took them to the local library for a night of family fun and learning. The 2014-2015 AmeriCorps year kicked off with AmeriCorps’ 20th Anniversary. Arlington Works! team members were among the 500 people, including Governor McAuliffe and Senator Tim Kaine, who attended the two-day Virginia Volunteerism Conference in Richmond. Later in September, the team bagged 2,888 pounds of chicken at AFAC, the Arlington Food Assistance Center, as part of 9/11 National Service.